The World of Darkness is terrifying, broken place. It has all of the problems and tragedies of our own, familiar world, but monsters also lurk in the shadows. Their presence makes the world more dangerous in a plethora of ways. Some of the supernatural beings prey on people in a literal sense — vampires drink the blood of the unwary, for instance, and crazed beasts hunt down people for their flesh. But other such beings simply make the world unsafe. They wage their secret wars and claim their territories and they all seek to keep the unknowing masses out. Knowledge is like water. It seeks to escape. It finds its own level. It seeps into everything, and no matter how well-maintained the secret, someone eventually learns it. In the soul of every living being in the world is the potential to know, to become part of this secret. And now, one brilliant woman has decided that the world can no longer afford to be ignorant. 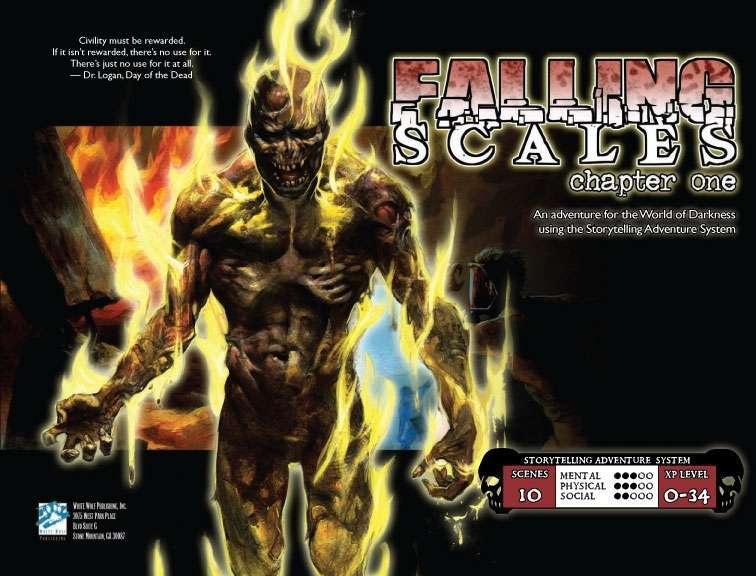 Falling Scales is the first installment in a multi-part chronicle. While these stories are meant to build on one another, they are also written so as to be useful and playable on their own. The only book necessary to run Falling Scales is the World of Darkness Rulebook. If your troupe wishes to play through this story using characters from one of the other World of Darkness games (or even a mix of several! ), information for doing so is provided. Falling Scales Chapter One is available in PDF and Print at RPGNow.com. ← DriveThruComics Launches Hero Initiative Fundraiser!